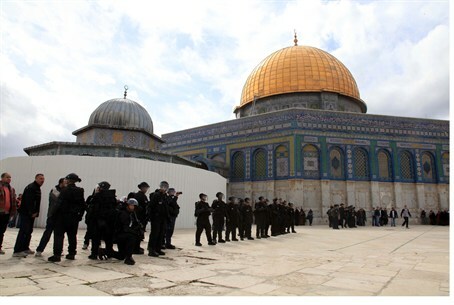 PA leaders: Obama should not visit the Al-Aqsa mosque in a way that might compromise its "Muslim sovereignty". Israeli Police, in an attempt to appease the Waqf, discriminate against Jews. They limit the number of Jewish worshippers allowed on the Temple Mount at one time in order to prevent conflict with Muslim worshippers. They often close the Mount to Jews in response to Muslim riots – despite evidence that Muslim riots have been planned in advance for the specific purpose of forcing Jews out. Last week, an Israeli Arab group, “The Al-Aqsa Heritage Institute,” issued a statement demanding that Israel halt its plans to bring more Jews to the Kotel (Western Wall) – which, the group claims, is holy not to Jews, but to Muslims. In fact, the group says, Israel is “defiling the holiness of the site” by conducting Jewish prayers there.